Ever since time immemorial, mankind has been seeing mystical apparitions in the sky. When a single person perceives one, we could say they are hallucinating, or are simply mystics. But it is clear our religions are based on these experiences and faith can grow from them. The prophets of the Old Testament heard God speak, St Francis of Assisi saw Jesus Christ when he was in contemplation. Pope Pius was greatly moved by an apparition of Jesus Christ as he lay on his deathbed in the nineteen fifties, even though the Vatican has never divulged this experience to the general public. Sightings of UFOs, light flashes, odd clouds and mother ships have been dramatically increasing worldwide. But a vision of the Madonna, Marian and Divine Mother are so awesome and emotional, people often fall to their knees weeping, sometimes healed of long-term afflictions. Many of these apparitions have warned mankind that apocalyptic events would visit themselves upon planet earth, if we did not change our evil ways! The most powerful visitation of this type was that of Our Lady of Fatima. Three Portuguese shepherd children, Lucia, Jacinta and Francesco were awoken into spiritual awareness in the early nineteen-century by the sight of a beautiful lady who divulged three sacred secrets. Two of them have been revealed but the third is kept in Vatican vaults as is said to announce the date, time and year of the end of the world. Of course, everyone knows the story of Lourdes and little Bernadette who fell to her knees at the sight of a beautiful, light lady. In fact, many have been cured of terminal disease in the fountain of pure Lourdes water that flowed onto the earth as a result of Bernadette’s faith in her vision. It would be inappropriate to sweep such sightings away with a mere wave of the hand. In Zeitoun, Egypt literally thousands of people witnessed the Madonna kneeling besides a cross on the roof of St Mary’s Coptic Church in Cairo. 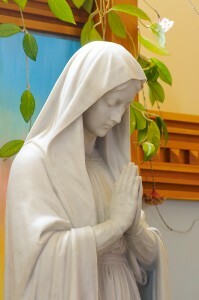 In Medjugorje, Yugoslavia: a group of children were stunned by a beautiful lady, later to be identified as the Madonna, carrying baby Jesus in her arms. The “children’s” connection to Divine Mother is still ongoing, even though they are now grownups and draw huge crowds of pilgrims. In the USA, Nancy Fowler receives messages from the Divine Mother, on the thirteenth day of each month. Interestingly studies show that spiritual visitations are seen apropos faith and belief. For example a Muslim will see Mohammed, or a Hindu, Krishna. Daniel Batson, of the University of Kansas has investigated these events, undertaking various experiments regarding religious experience. He came to the conclusion that “To say that the brain produces religion is like saying a piano produces music,” In fact; our brains incorporate spiritual insights, which form part of our natural “humanness”. Therefore, faced with the mysteries of the Universe it would be virtually impossible to remain indifferent to such miracles. Even though some people convert after seeing Divine Mother, retire to monasteries, or start leaving their “old” lives behind to help humanity in some way, it is clear these events go beyond religious doctrine, often occurring at specific times of historic significance. A fascinating phenomena also connected to these types of sightings are frequent balls of lights, or UFOs and in Medjugorje the sun has been seen to spin in the sky. Science is currently incapable of deciphering more than ten percent of these types of realities. The fact remains; when we see something so unusual we revamp our take and review our perceptions of life itself. Perhaps quantum mechanics will define such happenings in future. Perhaps there are universal realities, or dimensions, superimposed on ours that we just cannot decipher, know or see, for now we can only classify them as miracles and marvel!